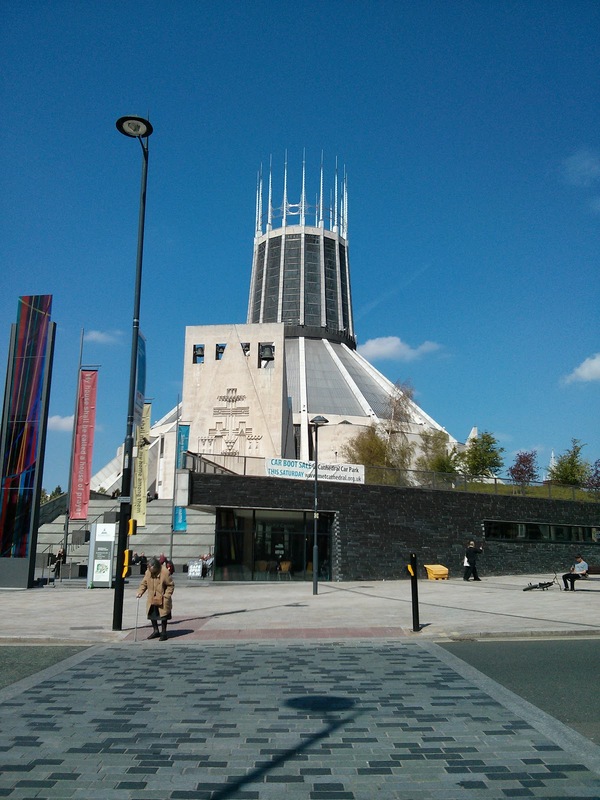 I was really happy to discover a while ago that we'd be in Liverpool for the annual Liverpool Organ Day -- it seems like I usually find that all the good stuff is happening just after we leave a place, or it all happened just before we got there. But for once the timing was right! 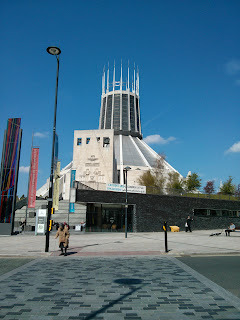 I took the bus (there's a bus stop right across the street from us) to Queen Square in downtown Liverpool and all the venues were within walking distance from there. For the performance, they'd placed the console (one of two) down on the floor right in front of the audience, so we had a good view of the organist, who was David Poulter, the music director for the cathedral. 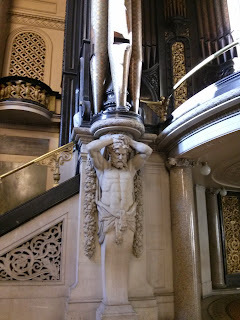 After the recital, we could go up and get a good look at it. 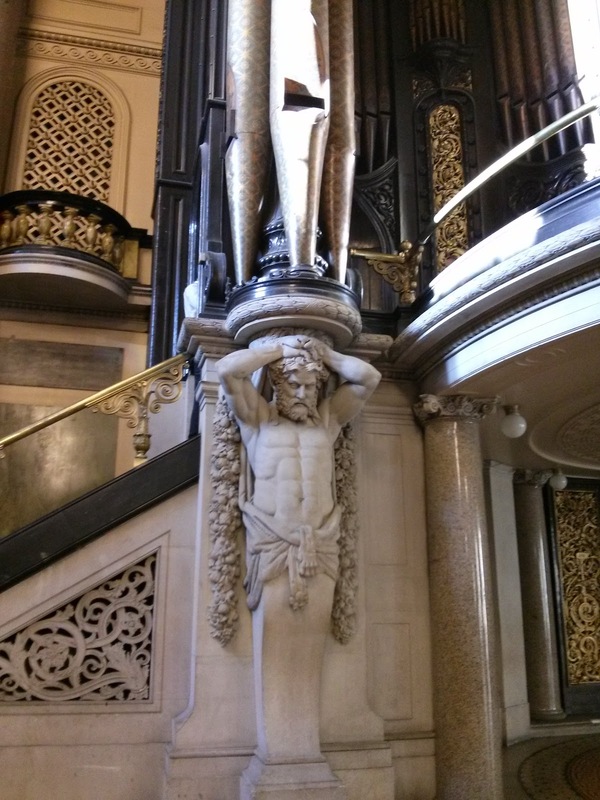 It's pretty impressive and is the largest organ in the United Kingdom. It sounded pretty great, too. 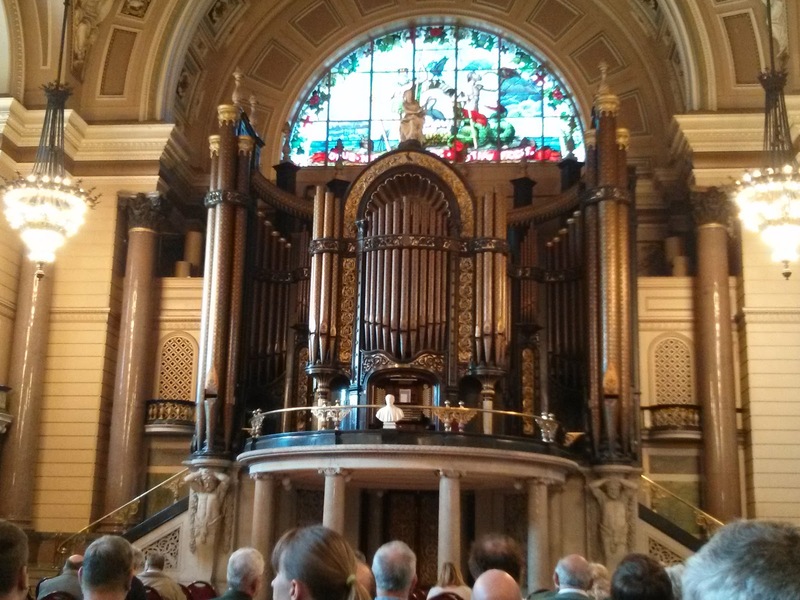 I don't know if the UK has a bigger organ culture than in the US or what, but there were about 400 people there, and many of them attended every one of the three recitals. 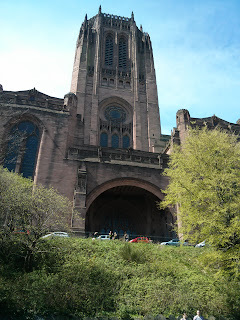 A little more about the Liverpool Cathedral. The architect and his wife are buried just outside the entrance, which I thought was kind of cool. 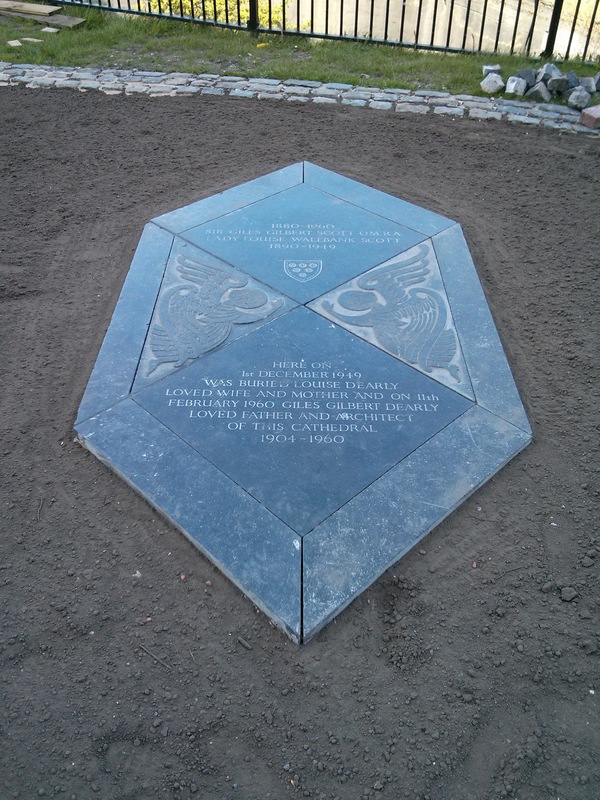 Next to the cathedral and below it is St. James Gardens, which was originally a quarry, then a cemetery, and now is a beautiful, sort of wild and secluded park in the middle of the city. 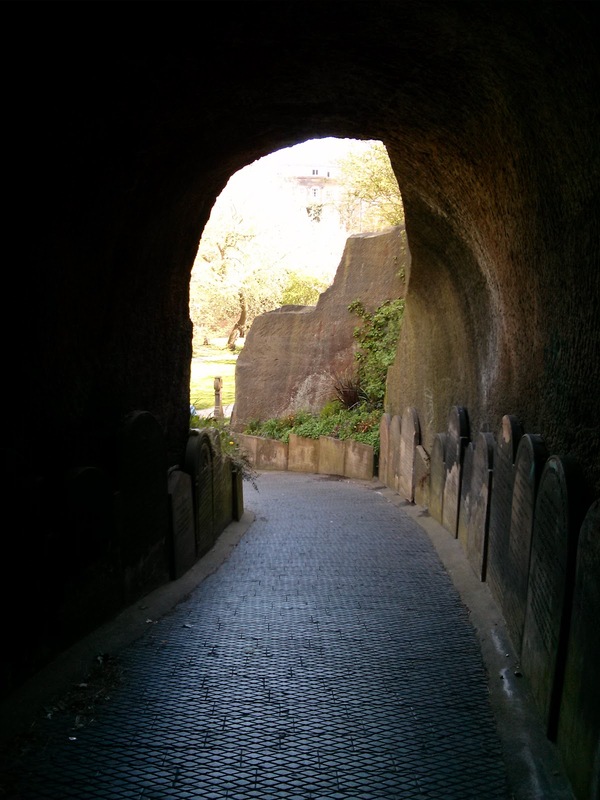 One entrance is lined with gravestones and takes you through a tunnel, also lined with gravestones. 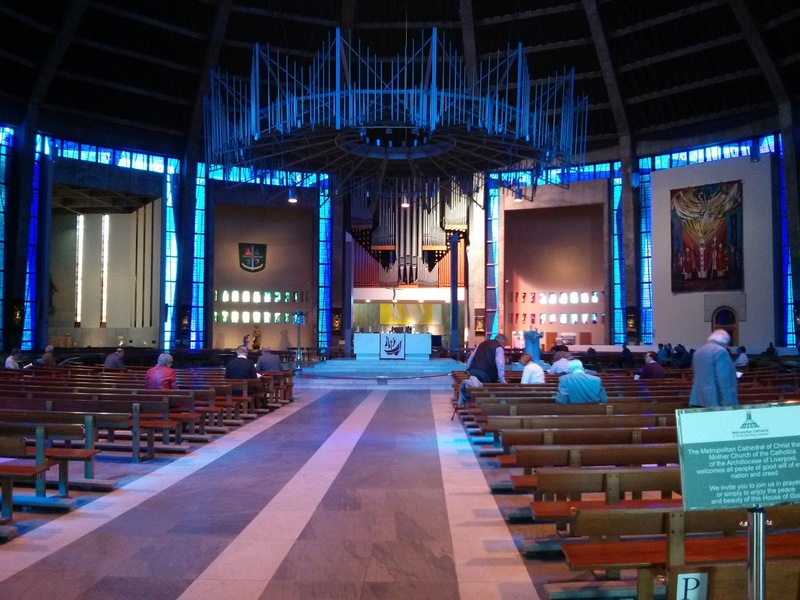 The second recital, at 3:00 pm, was played by Richard Lea at the Liverpool Metropolitan Cathedral, a Catholic cathedral built in the '60s. As you can see, it's not your typical cathedral. Very nice organ and some pretty neat stained glass and brightly colored, modern tapestry things to look at. The last concert was at 5:30 at St. George's Hall right next to Queen Square. This is also a massive building. It houses a large concert hall, where the organ is, as well as various courtrooms, although I don't think they are used as courtrooms today. I thought I might get tired of so much live organ music in one day (it must have been 3 hours and 45 minutes by the end of it all), but this third recital was my favorite. 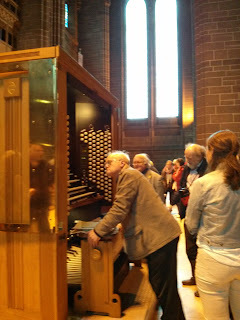 The organist was Ian Tracey, who was excellent. The organ was also fantastic, even though it was missing about 2/3 of its pedal pipes due to renovation. I couldn't tell; it sounded wonderful. It was a great day listening to great music. Since then, I've been listening to recordings of my favorite pieces from Monday's recitals. (YouTube can be such a great resource!) I like to make notes on the programs during the recitals and then listen to the pieces again later, because one truth about great music is that it gets better the more you hear it and know it. Even if I'm not making any progress in my own playing right now, I'm becoming more familiar with the music that maybe I'll be able to play someday.